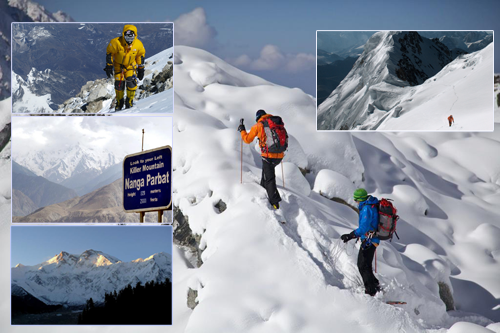 The core of Nanga Parbat is a long ridge trending southwest–northeast. The ridge is an enormous bulk of ice and rock. It has three faces, Diamir, Raikot and Rupal. The southwestern portion of this main ridge is known as the Mazeno Wall, and has a number of subsidiary peaks. In the other direction, the main ridge arcs northeast at Raikot Peak (7,070 m / 23,196 ft). The massive Rupal Face, noted above, dominates the south/southeast side of the mountain. The north/northwest side of the mountain, leading to the Indus, is more complex. It is split into the Diamir (west) face and the Raikot (north) face by a long ridge. There are a number of subsidiary summits, including North Peak (7,816 m / 25,643 ft) some 3 km north of the main summit. Near the base of the Rupal Face is a beautiful glacial lake called Latbo, above a seasonal shepherds’ village of the same name.